I was a big fan of D&D 3.5, right to the end. Even when they were shotgun releasing to get product out the door before announcing 4.0, I liked most of the source books that came down. One of my biggest disappointments, though, was the Epic Rules system WotC put out for 3.5. While I liked the idea of ramped-up, higher stakes game-play, the Epic rules just seemed to be a power creep enabler; sure things got bigger and tougher, but nothing really felt epic. Plus, the Epic rules only came into play once you had already played through to 20th level, so very little of the book could be used right away, if at all. 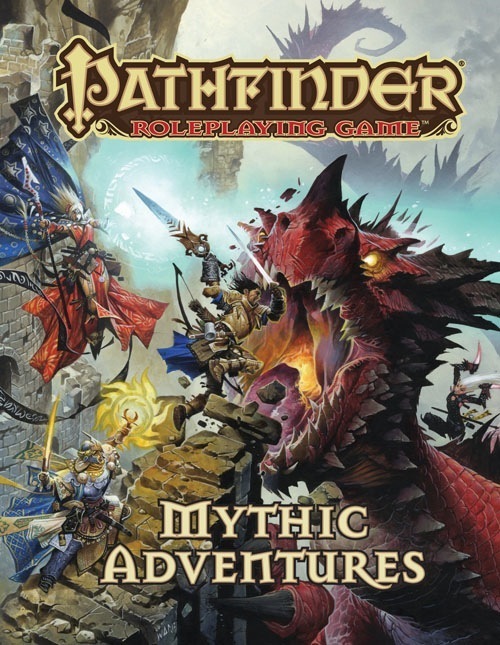 So last year, when I heard that one of the products in the pipeline for Pathfinder was something called Mythic Adventures, I had mixed feelings. Yes, I loved the idea of mythic, larger-than-life adventuring in Golarion. But all I could think of was the crushing disappointment of Epic, and so my hope was tainted with dread. Of course you’d think I’d learn to trust Paizo by now, wouldn’t you? Put simply, Mythic Adventures is everything I wanted the Epic rules to be, and wept bitter tears when they weren’t. The source book guides both players and GMs through the key elements of a “mythic” campaign: setting, tone, delivery, even how to incorporate mythic elements into an already existing game. The book features chapters on mythic feats, spells, and magic items, all ready to add a legendary feel to your campaign. The best thing about these new resources and challenges, is that you don’t have to wait for characters to get to higher levels. In a lot of cases you can begin adding these elements to the campaign right from the start, because the mythic abilities are gained in tandem with your regular character advancement. Because of this, and the fact that a mythic character is harder to kill, the book recommends GMs use the Medium or Slow advancement track for experience points, otherwise characters may quickly outstrip the challenges the GM has created. Not that the GM will be twiddling his thumbs; the book has an entire chapter of mythic monsters ready to challenge the players at every level, as well as rules for adding legendary power to creatures. So right off the bat the players are going to put that extra toughness to good use. They may be ramped up but so are their foes, so the mythic campaign won’t be a cake-walk. I’m not going to give any spoilers, but I will say the party’s first encounter with any of the mythic dragons will be a legendary sphincter clenching moment, one they won’t forget (assuming they survive, of course). Also included is a ready made mythic adventure for 7th level characters, either to drop in the middle of an existing campaign or as a mid-point adventure for characters that started as mythic. The book also talks a great deal about the the fluff and theory behind factors contributing to a mythic campaign. For instance, how to use failure to advance characters in your campaign. Setbacks are a key element to any great stories of legend; King Arthur and Hercules never had it easy, why should your PCs? It may seem at a first glance through the book, that most of the mythic abilities are just a simple amping up of the existing feats, spells, magic items and so on. And while that is true on the surface, once you dig down and really read how everything hangs together, you see how well the mythic abilities are well thought out extensions of characters’ abilities. Not really surprising, since Mythic Adventures is one of the books that went through an open beta test, much like the Advanced Race Guide and the Core Rules themselves. Because of this the new abilities hang together very well with the enhancement of standard abilities. While there are sure to be some rough bits that have to be smoothed over during play, there doesn’t seem to be any real game stopping issues. What I really love about this book is its elimination of the big problem I had with 3.5’s Epic rules: Mythic rules can be applied right from 1st level. No waiting around and slogging to get to the cool stuff, the cool stuff is yours right from the start. Of course, the cool stuff is there for the GM right from the start as well, so players beware! That leads me to the one potential issue that might arise in Mythic campaigns; GMs not making the campaign Mythic enough. It really does rest in the hands of the GM to keep his or her campaign at a truly legendary level, otherwise the players will not feel challenged and the game will quickly become like a bad MMO. So GMs be warned: before you dive headlong into a Mythic campaign be sure you are ready to keep a firm hand on the reins. But if you do, you and the players are in for a truly epic time. Have you had a chance to look at Mythic Adventures? If so, what did you think? Drop me your thoughts in the comments!